Apartment Bayview is a beautiful and spacious 2 bedroom apartment. 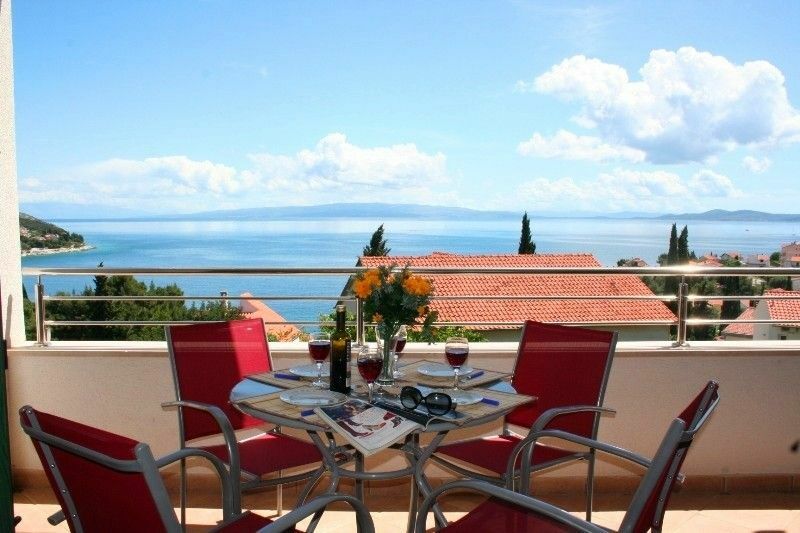 It is located just 150m from the nearest beach and 250m from the lovely Mavarštica bay. You can enjoy dining and relaxing on the balcony with its fabulous view over the bay. The shops and restaurants of the village centre are just 700m away and the apartment is 4km from Trogir, the delightful UNESCO World Heritage town with its many restaurants, bars and shops. The apartment consists of a large open plan living/dining/kitchen room. Double doors from the living room open onto the sea view balcony. There is one double bedroom with ensuite bathroom and a twin room with 2 single beds and there is a second bathroom. In the living room is a double sofa bed. The apartment is very tastefully furnished and comfortable. The apartment is situated on the first floor in the building which is in a quiet neighbourhood. There is a private parking lot for all apartments in the block. The apartment has free WiFi/Internet connection. Means of access: Getting to the apartment is easy by car or by plane. Split airport is a 11 km taxi ride away and access to the island is by bridge. But please note that local roads become congested during the high season. Directions to the apartment: You will check in at the office of Dalmatian Property Management in Trogir. We will supply you with photo directions how to get to the apartment. And will give you information about the region, supermarkets, restaurants and cultural events you might visit during your stay. You will feel completely looked after. And in a case you need anything else DPM personnel will be happy to help. Pets policy - please email to find out if you can bring your pet. I am the founder and director of Dalmatian Property Management. I moved from the UK to Croatia in 2004 and established the company and have offices and 6 staff in Trogir and Supetar on the island of Brac. Our valued client owns this lovely apartment that we look after. or standpipe in the bathrooms which produced regularly some bad smells. Probably a construction defect in the apartmentbuilding. Nothing that a good air freshener can not solve. Maybe a good idea to put these in advance in the bathrooms? Location was nice and quiet (june) and the island and main bay where nice. Trogir is stunning (take the taxiboat, a cheap extra attraction!) and Split was a nice daytrip, also by ferryboat. The local people were very friendly en the food was tasty and certainly value for money. Very nice apartment with beautiful views! We experienced professionalism regarding the booking. We arrived by car to a clean and beautifully located and well equipped apartment. Good parking condiditons and a friendly neighbor in the floor below. The house was quiet and had a well working air condition. Just a few min's walk to the nearest supermarked and only 10 min's walk to the boat that takes you into the center of Trogir. We have no problems to recommend it to friends or others. Driving tip: There migth be some traffic jam in the morning driving the shortest way to Trogir. Roads are very tight some places. Its a lot easier to follow the traffic signs direction Slatine but turn left when you reach the sea at D126. excellent facilities and location, very pleasent. Schöne gepflegte Wohnung mit tollem Meerblick. Lage ruhig und nur ein paar Gehminuten zum Strand. Die Insel bietet alles von Supermarkt, Bäckerei, Metzger, Restaurant... Schöner länger Kiesstrand Cococabana mit vielen Bars. Mit dem Taxiboot bequem nach Trogir in die malerische Altstadt. In der Hauptsaision viel Tourismus. Es lohnt sich ein Boot ausleihen und die Buchten zu erkunden und Schnorcheln. Der einzige Kritikpunkt meiner Meinung nach ist, dass nirgends auf der Homepage steht, dass für ein Haustier extra zu bezahlen ist. The apartment is located in Okrug Gornji on the island of Čiovo. Čiovo is connected to the mainland by a bridge. Come in the high season of July and August and you'll find Čiovo vibrant with life with holidaymakers from all over Europe. During the day enjoy the local beaches, water sports and the beach side cafe bars and restaurants. Split is another UNESCO World Heritage city and is just 30 km away and a visit to the 1700 year old Diocletian's Palace is highly recommended. For a quieter holiday come in May/June or September/October. Čiovo is a great base from which to visit other places like the beautiful Krka National Park and Skradin. And 40 mins north along the beautiful coast road north lies Primosten, a beautiful ancient 'island' town almost entirely surrounded by water.